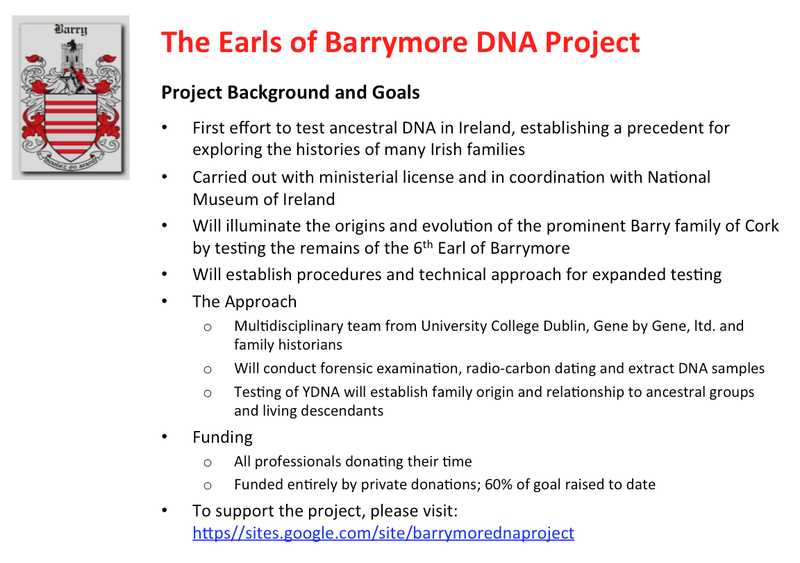 This is a guest post from Jim Barry, Project Administrator for the Earls of Barrymore DNA Project. This is a landmark project in Irish DNA research. If it is the great success we all anticipate, it will pave the way for Ancient DNA research in Ireland. And of course it is of particular relevance to anyone with a Barry amongst their ancestors. With a bit of luck, Jim will be speaking at next year's Genetic Genealogy Ireland (GGI2015) to update us on the project and what exciting discoveries this Irish Ancient DNA project reveals. If you feel like supporting this project with a financial contribution, please contact Jim directly on the email below - you may even qualify for a free DNA test. "This is the first ever project to test ancestral DNA in Ireland and promises a new way to unravel the mysteries of Irish families. Funded entirely by private donation, the project is soliciting additional financial support to begin work. A coalition of historians and academic scientists is using modern genetic science to unravel the mysteries of a prominent Irish family. Using techniques like those employed with the remains of King Richard III, they are about to conduct DNA testing of Richard Barry, 6th Earl of Barrymore, who died in Ireland in the 18th century. The Barry family came to Ireland in the 12th century with Norman and Welsh invaders and ruled vast tracts of land in County Cork, later expanding to the rest of Ireland and, through immigration, throughout the world. The objective of the project is to explore the ancestral origins of Richard Barry and his family and to determine how he may be related to living family members. If successful, this project will establish procedures and technical approaches that can be applied to other Irish families, adding an unprecedented understanding of our ancestral heritage. 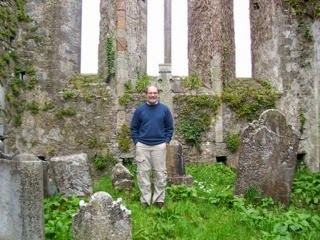 Jim Barry standing at Buttevant Abbey, Cork, founded by the Barry family in the 13th century. Beyond the historical value, there is also excitement about the prospects for scientific discoveries. Dr René Gapert, a researcher in forensic anthropology at the School of Medicine & Medical Science of University College Dublin, aims to establish a biological profile of the skeletal remains in the crypt. René has worked as a consultant forensic anthropologist on national and international cases and projects. His colleague at UCD, Dr Sean Ennis, a clinical geneticist, whose team developed the programme Ancestry Mapper, which looks at local and global population relationships, hopes that the project will help to refine methods for forensic analysis and DNA testing that will be valuable both to the academic community and to other Irish families who are exploring their roots. All of the professional members of the team are donating their time, and the project will begin as soon as funding for logistics has been secured. To date, some 60 percent of the needed funds have been contributed by private donors. The team is offering free DNA test kits to select contributors." Bill Barry cheers, you are out there somewhere, we spent many a happy holidays in Greece!